Rung as part of the 90th birthday celebrations for William (2). 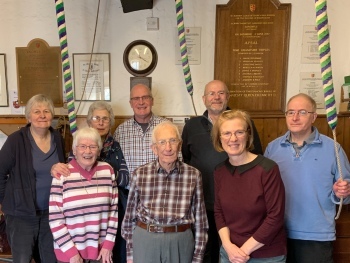 All the regular ringers at Knowle would like to be associated with this quarter and many joined William and Margaret (his wife) for a celebration lunch immediately afterwards. The band (l-r): Ruth, Ann, Jill, Stephen, William, Andy, Judith, AJB. First submitted Saturday, 2 February 2019 at 18:28:08 by Stephen Shipley. Sent for publication in The Ringing World on Saturday, 2 February 2019 at 18:29:04, and printed in issue 5627.